Get ready to blast off on an exciting journey into the stars with this mobile game. Cruise through the galaxy while you try out challenging puzzles and link together all the jewels. “Matchmaker, matchmaker, make me a match!” That’s a line from a song in the old musical Fiddler on the Roof but it’s also your goal in each one of the challenging free match 3 games that you’ll find right here in this category. 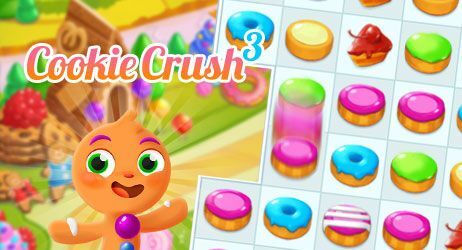 Can you link up all of the delicious and delightful sweets in Candy Crush? How about the ones featured in the equally puzzling Candy House and Back to Candyland 4? If you don’t have much of a sweet tooth, you can also link together precious gems in 1,001 Arabian Nights and Mythical Jewels or lots of tasty veggies in Farm Heroes. Or maybe you’d like to crush rows of colourful blocks. You can do just that in Spikes Ahead. There’s also a spectacular sorceress that could use your help matching up tons of stuff in Cute Puzzle Witch or a miner in search of an assistant to join him on a death defying quest in Gold Rush: Treasure Hunt. There’s lots of different ways that you can give your puzzle and matching skills a serious workout in this category of totally free online games.